Are you an aspiring conductor looking to advance your conducting and leadership skills? The Royal Philharmonic Society is now scouting for candidates to its Phase 1.5 Women Conductors workshop to be held at the University of Liverpool on 17 March. 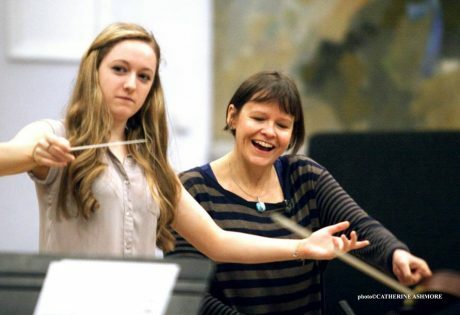 The Royal Philharmonic Society Women Conductors programme is now calling for applications to its Phase 1.5 workshop to be held at the University of Liverpool on 17 March. Women Conductors is the Society’s nationwide initiative to redress gender imbalance on the orchestral podium by giving more opportunities to female musicians to take up conducting at early stages of their career. Led by acclaimed conductor Alice Farnham – recently featured in the 2018 BBC Women’s Hour Power List – the Phase 1.5 workshop is tailored to musicians aged 18 and above who possess some conducting experience and wish to make it a more serious aspect of their work. Participants will receive expert coaching on baton technique and leadership skills, and conduct a professional ensemble consisting of players from the Royal Liverpool Philharmonic Orchestra. A select number of bursaries are available for those in financial need. Apply by midday on Monday 18 February via the RPS website: www.royalphilharmonicsociety.org.uk. For further enquiries, please call 020 7287 0019 or write to admin@philharmonicsociety.uk.